About 13.2 million households in the United States obtain their water from private wells, a method that offers no assurances of the water’s quality. Testing private wells can be expensive and results can take weeks. But two different types of water sensors developed by researchers at the University of Wisconsin-Milwaukee offer low-cost, immediate protection against the threat of contaminated water supplies. The two technologies were developed collaboratively with industry partners in a research consortium called the Water Equipment and Policy Center. The companies, including three based in Wisconsin, have subsequently licensed the intellectual property through the UWM Research Foundation. Junhong Chen, distinguished professor of mechanical engineering, has led development of real-time sensors that can be immersed long-term in a liquid environment to continuously monitor for even trace amounts of heavy metals or bacteria like E. coli. The technology has been licensed by A.O. Smith Corporation, Badger Meter, Inc., and Baker Manufacturing, LLC, all in Wisconsin, and by Gannett Fleming, Inc, in Pennsylvania. The three Wisconsin companies also have licensed a hand-held microfluidic sensor created by Assistant Professor Woo-Jin Chang in collaboration with UW-Madison faculty member and co-inventor Sundaram Gunasekaran. The sensors in this device identify heavy metals at very low levels and can determine the pH of water with a single drop. The pH is a measure of the water’s acidity, and it must fall within a certain range to maintain the health of organisms that depend on it. “The WEP member companies have access to early-stage university technologies and through close collaboration can help researchers like Chen and Chang focus on the most important problems that water equipment companies face,” said Robert J. Heideman, senior vice president and chief technology officer at A. O. Smith. WEP formed in 2010 with partial funding from the National Science Foundation and is designated as one of NSF’s Industry/University Collaborative Research Centers (I/UCRC). The member-based consortium, which includes UW-Milwaukee and Marquette University researchers, aims for creation of the next generation of products and processes in the water industry. Sponsorship from industry members pays off in royalty-free access to the intellectual property resulting from the research projects they support. “The benefit to well owners using a low-cost, real-time sensor of groundwater contamination is immeasurable in terms of health to the household,” said Don Wesdell, president and CEO of Baker Manufacturing. Chen’s sensors have potential beyond security for private wells. 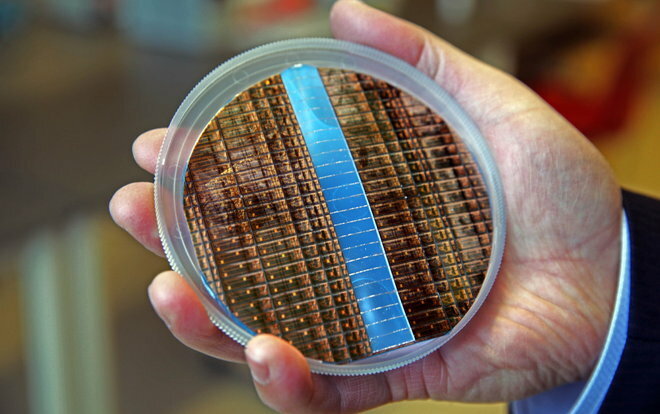 They are so small that hundreds of them occupy a silicon wafer the size of a fingernail – the right size to be integrated into existing water equipment such as pumps, purifiers, meters and pipes. Chang’s device, which uses low-cost, disposable paper strips, will benefit companies collecting water samples in the field.